The battle is heating up in New Orleans along the abortion front. It is all out WAR. 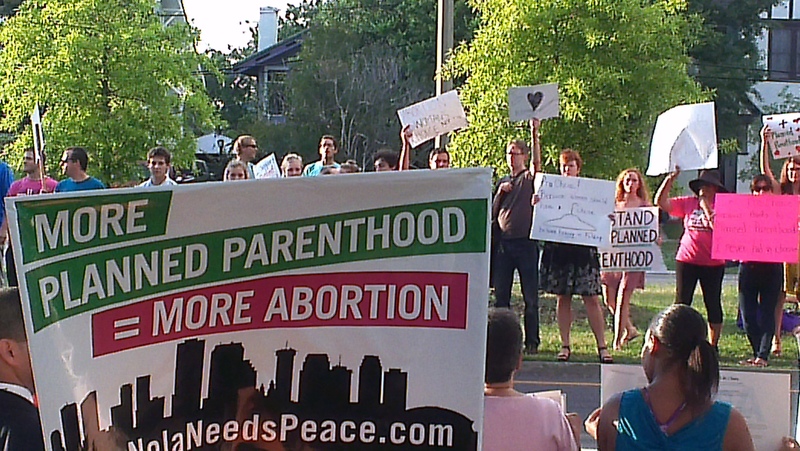 Nearly 1000 faithful prolifers came to the NOLA Needs Peace Not Abortion Rally. The speakers were inspired and inspiring. If it weren’t for the mega heat, it would have been better. The future Planned Parenthood facility has now been dubbed a regional abortion facility. I suppose the ‘health center’ facade has skewed? Judging from the ‘protesters’ that showed up [I’m surprised their moms let them out past dinner], it’s easy to see what’s going on here: Planned Parenthood goes to universities and colleges to promote these 18-year-old white kids to promote abortion to a city that is over 60% black. Did Planned Parenthood think that no one would notice their blatant racist attack on New Orleans? Besides that, this new future facility is also on a very well planned and convenient bus line that brings women in from all over the city. It is no mistake that this site was chosen because of the close proximity of Mississippi which is nearly abortion facility free. An excellent marketing ploy, wouldn’t you say? The Planned Parenthood property has a temporary fence around it with a ‘guard’ to make sure none of us pesky prolifers go and pray on it. Tomorrow is supposed to be the ground breaking ‘ceremony’ on the property, and guess who’s assisting them…yes, the Unitarian ‘church’. That’s like Godzilla helping King Kong. Pitiful, just pitiful. At the rally, I met the man who started my prolife ministry, although unknowingly. On my way to work to my new job I saw a man carrying a huge crucifix. I didn’t think much about it at the time but the next day I realized that there was an abortion facility there. Well it was time, God said. Yes it was. I had to stop suppressing the hate, frustration and self-loathing I had been carrying around since 1978. I had an abortion, I had to face it, I had to be forgiven. I enjoyed telling Richard the crucifix carrier that because of his faithful witness I am a Minister with a prolife ministry. Thank you, Richard. I encourage everyone to tell the person(s) that sowed seed in your life how they have affected you. I also had the privilege of meeting the woman who held the 40 Days Campaign in Baton Rouge. She is a precious soul with a gentle, loving spirit. I am so thankful to meet such soldiers in the fight for LIFE. So, tomorrow is Planned Parenthood’s big day…but it will be short-lived. Progress is coming along nicely within our state government. This is going to take a bit longer than Planned Parenthood would ever imagine. The Abortion Battle of New Orleans is going to be fought hard…prolifers are not going away. I find it extremely telling that so many who have had abortions are now uncompromisingly pro-life (myself included). We may be the only group that is trying to warn others of the evil that is what we (and the baby) went through, but is told to shut up by those trying to get more women to under go the same trauma. Are we the only group that is told to sit down and shut up after horrific experiences?